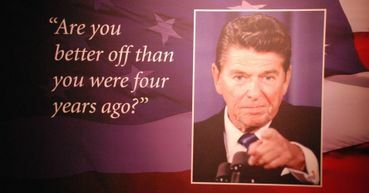 I believe Reagan was the beginning of the downfall of this country. I did not like Reagan and this hero worship some Republicans have for him is well I don't get it. I would bet that there are very few who would state that we are definitely better off. I do know that jumping off the corporate rat wheel and moving back out into a more rural area has upped my happiness quotient measurably, however. Although this article is US based, it poses a question that is universal, a question for everyone. In some places, the consideration of "better than 40 years ago" is somewhat moot when people are just trying to get through today. Forty years ago, I was starting out in a junior management position in a bank in an isolated small town on Canada's west coast. I saw a future I could be proud of. I didn't have much . . . I lived in a motel because there were no apartments in town. Even the lone police constable in town lived in the jail, bunking in the cell when it was not otherwise occupied. We didn't mind because we knew there was better ahead. Now, almost 63 years young, when I ask myself the same question, I can still say "yes" on balance. True, my health isn't what I had hoped, but I'm not dead and I still enjoy being active. Yes I have a university education, but it doesn't end there. I am still learning but since I am retired, I am learning things I want to learn like US politics (don't get me started) and a third language . . . Farsi, the primary language of Iran. Continuous learning is about not letting the brain age, and about still showing some cajones, even if female. But will our children and grandchildren be able to say in 40 years. Will they be able to get a good but affordable education? Will they be able to find meaningful employment? Will they have affordable health care for themselves and their issue? Will they have clean water and breathable air? Will they have the funds and the time to buy a house if they want to? I likely be around in 40 years to hear the answer to "Are we [I] better off than we [I] were [was] 40 years ago?" but I hope the next generations are able to answer "yes". My answer is NO, we are NOT!!! My opinion if the minimum was 75 cents/hr in the 50's then it should be around $20 today and maybe as high as $25 if we want to recreate a middle class. We are not better off. Noted. Thanks, Lynn. In many ways we are better off due to technology and science. Unfortunately, those at the top have decided they want "more," which has caused the majority of us to be worse off economically. Along with the many here at Care2, I will continue to fight against dirty energy, banksters, and a corrupt political system and media so that my kids & grandkids will have an even better future. Our work is cut out for us. No, I don't think so. But, I agree with Lois Jordan that we are better off because of science and technology but a lot of that is being used for evil and not just good. Regardless, looking forward to a better 2015! Nancy is right. Just about every problem the US has today can be traced back to the elitist politics of Reagan. Federalists have no place in this country yet, here they are. Controlling everything down to the voting machines, like the nazi's they are. If only we could get Reagan back to replace the current doofus. Bill thinks we're not better off because Obama didn't fix the economy. Not knowing that it's been entirely up to his Nazi party to pass legislation that taxes the rich and puts Americans back to work�Am I right? See�if you watch fox, you know what the cult followers think. It's that easy. It's Obama's fault! Impeach Obama! Obama missed an opportunity to get Americans back to work early in 2009. All he had to do was focus on the job engines in our country our large and small businesses. He didn't do that. Instead, he turned to his legacy healthcare bill which impacted more jobs being lost. Fox News, is the most watched cable news for the 13th straight year. MSNBC and CNN are suffering very low viewer ratings...to name just two. The two midterm elections in 2010 and 2014 shows that Americans aren't happy with Obama's policies and they voted in a republican majority in the House in 2010 and a very large majority of republicans to take control of congress in November of this year. We can't impeach Obama because then we would have to deal with the clown Joe Biden. President Clinton was given an all republican congress his last two years in office. Never underestimate the power of the American people to fix a problem with their votes. Very complex question, with equally complex answers. We might be better off in some ways but less in others. Eg we might be earning more money, but have less time to spend with our families. Diane too�The job engine is the well paid consumer, period. Obama tried to complete the 1.3 trillion stimulus that the right approved of twice for gwbush/mabus but refused to complete under Obama. See how much you don't know, Diane? Fox not news has a cult following. That doesn't make them important to the country. They carry the water for the richest 1% to which, you are not a member and never will be. They lie and you swear by it. The elections reflect the election fraud carried out by Karl Rove. A supporter of Nazi policies. Will you ever make sense, Diane or are you trapped? No need to personally attack me. Once you learn how to have a conversation I'll be more than happy to respond to your post. Donn, I agree with you! We need a Ronald Reagan but there's not one in sight, unfortunately!! Sent you a big green star. So you're the one getting me banned with what YOU call attacks, eh? I'm merely correcting your false notions. How do you have a conversation with those that refuse the truth? Ronald Reagan started this federalist attitude that the rich should rule over the rest. Bush added Nazi fascism and put it on steroids. The rich NEED to pay their dair share of taxes. We can not be great again until they do and that money is used to rebuild our neglected rust heap. Get used to it Diane. I grew a pair. You can too. Whining GOP operative that keeps reporting me for correcting her ongoing propaganda. What's really funny, Reagan would have raised taxes and fixed this mess 6 years ago. He was a fool but he wasn't stupid. You have been getting banned Jason? Well, that is hard to imagine. And then blaming other people for it. And then you claim you have grown a pair? I think people who have grown a "pair" generally accept responsibility for their actions. I try. You can too. Please, Diane, Donn and Jason,l can we keep personalities out of the thread. The last thing that the US needs is Reagan's trickle up economics, aka Reaganomics. It is the trickle up effect that is widening the income gap as well as creating other disparities. Listen to the words of billionaire Nick Hanuer when he says that the real job creators are the consumers. With the unemployment partially created by shipping jobs overseas, American consumers had less in their pockets to spend which crushed more US jobs. Could Obama have done more for jobs in 2009? . . . perhaps but there were a lot of different things going on, and Republicans were fighting him all the way. Let's face it, there was a Republican meeting the night of his inauguration in which McConnell, among others, vowed to obstruct Obama all the way. IMO, I think the US is better off in many ways and it was good that Reagan took his jellybeans and went home. Could Obama done things differently? Yes, but he was thwarted at ever opportunity by a recalcitrant GOP. Nancy W said it for me !! !